Start by packing sensibly for your ride. Take a cell phone unless you will be out of your provider’s coverage area. Being able to call a friend to pick you up with her trailer could prove invaluable. Wear your helmet and sensible footwear to help keep you safe. Purchase a small saddlebag to latch onto your saddle. 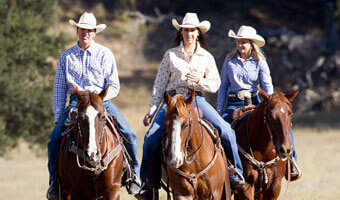 Many are lightweight, roomy and sturdy, and work for both English and Western saddles. Duct tape: Where would the world be without duct tape? Duct tape can hold a pad in place over a wound and can even be used to apply some steady pressure to help manage bleeding. If your horse loses a shoe, duct tape can make a temporary set of footwear. Freezer pack (small size): Get a squeezable freezer pack to start a cooling reaction on your horse in case of injury. The pack can be applied to bruises and stings to minimize swelling and inflammation. EpiPen®: If you or your horse has a known problem with bee stings, carry an EpiPen® for you and ask your veterinarian for a suitable way to treat your horse. She will let you know how to use it for your horse. Ointment tubes (two): You should have two ointment tubes: one containing antibiotics and one containing cortisone. Use the antibiotic tube to disinfect a wound and the cortisone tube to treat hives or stings. Nonstick gauze pads or sanitary pads: Gauze pads or sanitary pads can be placed over open wounds. Saline or eye wash: Saline or eye wash can be used to flush out eyes and small wounds. Bandana: This can be wetted with your saline wash to clean a wound or used as a blindfold to lead a worried horse. Carry a knife. A simple jackknife, if it is sharp, may be all you need. A knife can free your horse from a tangled lead rope or reins. You can also use it to snip barbed wire if your horse gets caught in it. Liberally apply a long-acting bug spray, such as Ambush® Insecticide & Repellent, and carry some if you will be out for a long time. While not an emergency per se, running into large numbers of black flies or mosquitoes can make you and your horse very uncomfortable. Many sprays will discourage bees as well. Pack some other extra gear too. Attach a spare halter and lead rope to your saddle. Put a support wrap in your saddlebag to help your horse if he injures a leg. And make sure that you have a hoof pick—a horse that suddenly goes lame may simply have a stone caught in the frog. A hoof pick can flick that out and off you go! Plan ahead: Know the trail you plan to ride. Make sure, especially if you are heading out alone, that someone knows where you are going and when you plan to return. If you are riding a green horse, get a friend with a steady trooper-type horse to accompany you. Also check the weather forecast. While not infallible, a forecast can advise you of the likelihood of a storm blowing up. If your horse gets cut, clean the wound carefully. If it continues to bleed, apply a pad. A venous cut drips, while arterial cuts spray. An arterial cut requires pressure applied to stop the bleeding. Most equine emergencies revolve around lameness. Always check the hooves first for any stones, then start from the bottom up and feel for warmth or swelling. Remember, your horse has matching legs, so you can compare one leg to another. If you feel warmth or swelling, look for water and get your horse to stand in a creek or pond. A creek is preferred because the running water will stay cooler and massage the area a bit as well. 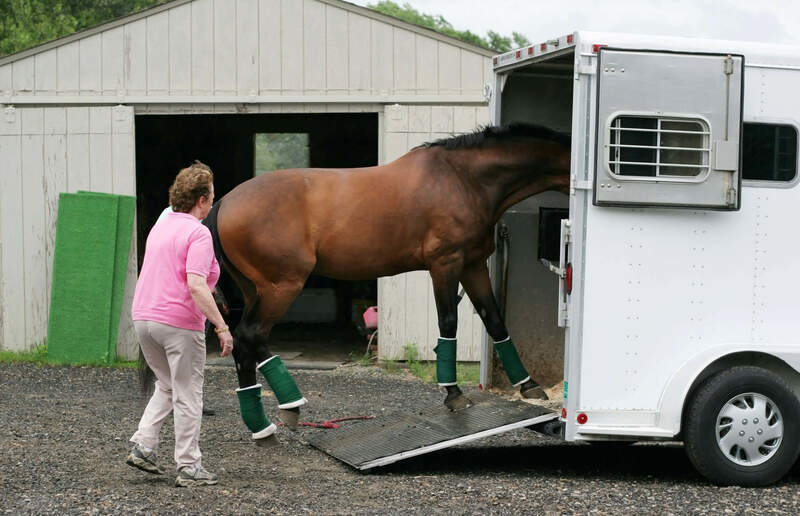 Ideally, you should walk your horse home or to the trailer if he is lame. The less weight he has to carry, the easier it is on his injured leg. If you are facing a long hike home, try to arrange for a friend to bring a trailer. Ambush is a registered trademark of Farnam Companies, Inc. EpiPen is a registered trademark of Mylan Inc.